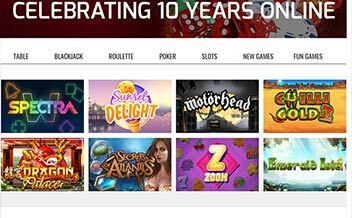 Launched in 2007, Devilfish Casino is a classic looking casino that focuses on offering a diversity of games. It is owned by Imperium Network Solutions Limited Casinos and powered by a wide range of leading software giants. Games here are from Microgaming, Net Ent, Nyx Interactive, NextGen Gaming and Betsoft and include a range of slot machines, video poker games, table games, niche titles and live dealer casino games. However, there are concerns over the casino being unresponsive. The casino has been in the industry for about ten years and has established an impressive reputation that gives it a competitive advantage or edge over other casinos as it has the experience of dealing with gamers. The Casino offers its players a stunning array of online slots and other casino games, including a built-in live casino for players looking for a real table gaming experience. The casino holds a license in the jurisdiction of UK Gambling Commission and Curacao. Pretty much every casino on the web will offer some kind of introductory deal to woo new platers. Devilfish Casino is no different. There is a 200% bonus up to €200 on your first deposit at the site plus 100 free spins on slots. There is also another 100% bonus up to €500 on a player’s second deposit. The casino also has a 10% cashback bonus system. 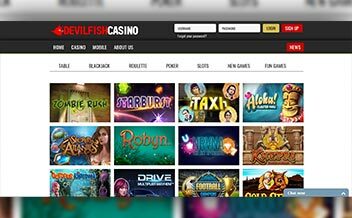 Sinceslots are the most popular online games, Devilfish Casino has taken particular care to ensure that every kind of gambler can have a good time. From scary games like Blood Suckers slot and Devil’s Delight slot to more cheerful ones like Flowers slot and Magic love slot, there’s something for every kind of slot lover. There are other games such as Miss Midas slot, Psycho slot, Mamma Mia, A Night at Paris slot, and many others. Even though Devilfish Casino has one impressive slot collection, that doesn’t mean they are neglecting other kinds of players. If table games are your thing, you can get immersed in a variety of them based on dice, card, or specialty favorites. Enjoy a number of blackjack or roulette variants, as well as others like Caribbean Stud Poker, Casino Hold’Em, and baccarat. If video poker is your game, you can enjoy four different varieties to get your fix. Although four is far from varied, players can play any of them in single-hand or multi-hand flavors. If you want to play multi-hand, you can choose from 5, 10, 25, 50, or 100 hands at a time. 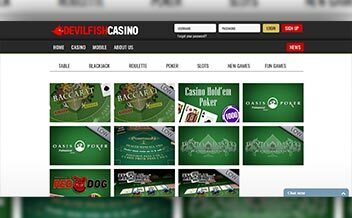 Since Devilfish Casino provides games from NetEnt, Microgaming, Betsoft, NextGen Gaming, and Nyx Interactive, players can rest assured that they are getting a wide variety of games that can be played directly through their favorite Web browsers. American Samoa, Estonia, France, Cuba, Denmark, Turkey, Tanzania, North Kore, Kenya, Israel, Guadeloupe, Spain, United States and others. Bank Wire transfer, Neteller, Skrill, Visa, MasterCard, and Paysafe Card. US dollars, Australian dollars, Canadian dollars, Euros, Norwegian Kroner, Swedish kronor, SA Rand. Devilfish Casino is strongly committed to providing a good mobile gaming experience for all players and its games are available to play instantly on all mobile devices, including Android, iPhone devices with the top quality software providing an excellent experience with great graphics and smooth gameplay. 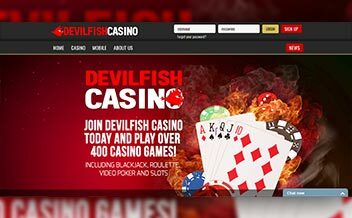 Devilfish Casino is a strong choice for online gamers looking to enjoy different casino games, slots, poker, table games and a live dealer casino. The only limiting factor is Devilfish’s refusal to communicate with affiliates.